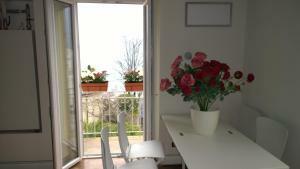 Two Bedrooms Amazing Lake View price per day from CHF 170 Two Bedrooms Amazing Lake View is a self-catering accommodation with a lake-view balcony located in Lugano. The property is 600 metres from Lugano Station and 1 The air-conditioned apartment comprises a fireplace, a well-equipped open-plan kitchen with dishwasher, and a private bathroom. Casetta Margherita Featuring a garden with outdoor furniture and a patio, Casetta Margherita offers self-catering accommodation located in a residential area 1 The living room comes with a flat-screen satellite TV, a library, a sofa bed and a dining area. The bathroom, featuring a bath, comes with a hairdryer. Monte San Salvatore is a 15-minute drive from the property..
Villa Sassa Hotel & Spa price per day from € 114 Surrounded by a 16,000 m² park, Villa Sassa Hotel, Residence & Spa offers a spacious spa area and panoramic views over Lugano, Lake Lugano, and the surrounding mountains. Each of the comfortable rooms comes with a balcony, satellite TV, a minibar and a safety deposit box. The Villa Sassa’s 3,000 m² Spa and Wellness Club includes heated indoor and outdoor swimming pools, a hot tub, a sauna, a Turkish bath, a relaxation area, and a fitness centre..
Hotel International au Lac price per day from € 94 Right on the shore of Lake Lugano, the 3-star superior Hotel International au Lac offers air-conditioned rooms, a garden with an outdoor pool, free WiFi, and a lobby bar. The Old Town of Lugano, featuring several restaurants, bars and shops, is just a short walk away. A private underground car park can be used at an additional cost..
Hotel Gabbani price per day from € 155 Offering stylish rooms with free Wi-Fi, the design Hotel Gabbani is centrally set on Lugano‘s Piazza Cioccaro Square. The Main Train Station is reachable by the city cable car, only 50 metres away. Clear lines, soft shapes and ad hoc elements like a bathtub next to the bed or a small staircase will add up to the atmosphere..
Delfino price per day from € 114 The Hotel Delfino has a privileged location close to the lake shore and next to the pedestrian area which leads into the heart of the city of Lugano. In the evening the Restaurant Delfino is open from 19:00 to 21:00 You can choose between the menu of the day or you can dine à la carte..
16. Turn left onto Gotthardstrasse/Route 2. 17. Turn left onto the ramp to Gotthard. 20. Take exit 49-Lugano Nord toward Ponte Tresa/Aeroporto. 21. Keep left at the fork, follow signs for Lugano. 22. At the roundabout, take the 2nd exit onto Autostrada Lugano Nord heading to Lugano. 24. At the roundabout, take the 1st exit onto Via Bioggio. 25. Continue onto Via Besso. 26. Continue onto Via Romeo Manzoni. 27. Continue straight onto Via S. Gottardo. 28. Turn right onto Via Cantonale/Via S. Gottardo. 29. Turn right onto Via Cantonale. 30. Continue onto Corso Enrico Pestalozzi. 31. Turn right onto Corso Elvezia. 32. Continue onto Riva Giocondo Albertolli. 33. Turn right onto Piazza Riziero Rezzonico. Ski resort Airolo, excellent nightlife, many restaurants and pubs. 65 km from town of Lugano. Ski resort Andermatt, number of cross country pistes: 20km. 75 km from town of Lugano. Ski resort Aletsch, recommended ski resort for beginners. 81 km from town of Lugano.